Old flour: I hate to admit it but stuffed in the back of cabinet was a quarter of a bag of seven year old flour. There the bag sat forgotten and unloved. So out I went and sprinkled the flour on each ant hill that I could find. They abandoned the site but simply expanded their tunnels and popped up in a new hill nearby. So, yes it is a good use of ant control but I would not buy a new bag, as it may be a short term fix. Old Oils: I found a can of old olive oil (purchased by mistake as it claimed to be cholesterol free and tasted awful). Again a mistake shoved to the back of the cabinet. Now here was real success. I nailed two big nests that were plagues for years. Ants do not like greasy soil. This also brought back memories of when I was an archaeologist and I do not remember seeing ants in any of the shellfish laden sites. The soil at these prehistoric sites was a heavy black earth and on the greasy side. There were, however, ticks as apparently nothing short of chickens, can discourage them. So I ran out of the olive oil and unwilling to spend money on olive oil prices I went for canola oil on sale which did not work as well since it has a lighter consistency. The secret is to mix the oil with the dirt to really seal the deal. The downside is oil does stain concrete and I do not know if you can grow anything on that small patch of earth but I will find out. 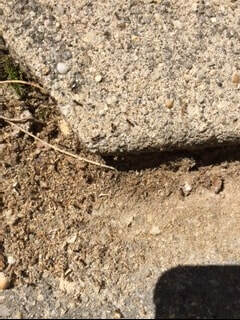 I am particularly interested in getting rid of ants that appear in the cracks of walkways and patios. My stains on the concrete appear to have been short lived however and the ants are still not back. Oil is successful. Chalk: If you have had or have young children you probably have chalk. I have been told ants will not cross a chalk barrier. If you have ants visiting you on the inside of your home, draw a line on the house foundation. The downside is it will wash away and you will need to renew your barriers. You can also draw a circle around any ant hill if it is between the cracks of concrete. I have been thinking of grinding up chalk and putting that on each ant hill but I rather think it would have the same impact as old flour. The ants will just reestablish another hill not too far away. Baby Powder: Old baby powder also works like old flour. My husband found an old jar (we never used this on our children –fyi-we used corn starch on their little bottoms –always) and I do not know why we had it but I gave it a try. I am nervous about the environmental impact of baby powder (talc) and limited that application to sidewalk /pathway cracks that were not in contact with any vegetation. It works but like flour and chalk and I prefer to use those products. I have heard other suggestions which include lemon or lime juice. The problem is I like those fruits in my water so they never make it out into the garden. Cayenne pepper or garlic powder are also possibilities. These products are used like baby powder or flour. I would be concerned about other animals burning their paws or mouths. If you go this route, try the Dollar Tree for $1.00 containers of the spices. My goal is not to rid my property entirely of ants as they do have several useful purposes. I am interested in population control. Ants remove dead insects and clean the environment. In addition they aerate the soil and are pollinators. So a little population control is what I am after. Who am I kidding major population control is really what I want. Maybe if they did not bite…… or crawl on my shoes and legs when I am in the garden…. I might be slightly more tolerant. Not really sure…..
Winter’s Edge Micro Farm: We are harvesting the organic garlic right now. The garlic has to “cure” but we have over 150 bulbs. In addition, I am spending a great deal of time weeding. Some of my beds last year were neglected due to my injuries from a car accident (the accident was not my fault). I am attempting to tame the wild beds as soon as I can. Also this summer the preserve is open with trails and bird and butterfly gardens. The gardens and trails are free. The Museum has a modest price for admission. There is also a great gift shop filled with treasures. My shell wind chimes hanging on the roof of my porch overhang are from the Museum. The Sea Cliff Butterfly Garden is looking beautiful. Follow them on Facebook: https://www.facebook.com/FlutterbyFoundation/ . This garden is located at the Marden triangle.